For more than 50 years JSC BMGS has been operating in construction of marine facilities and civil engineering construction. Construction of the harbour facilities, pile foundations of any type, bridges, railway facilities are the core activities of the Company. 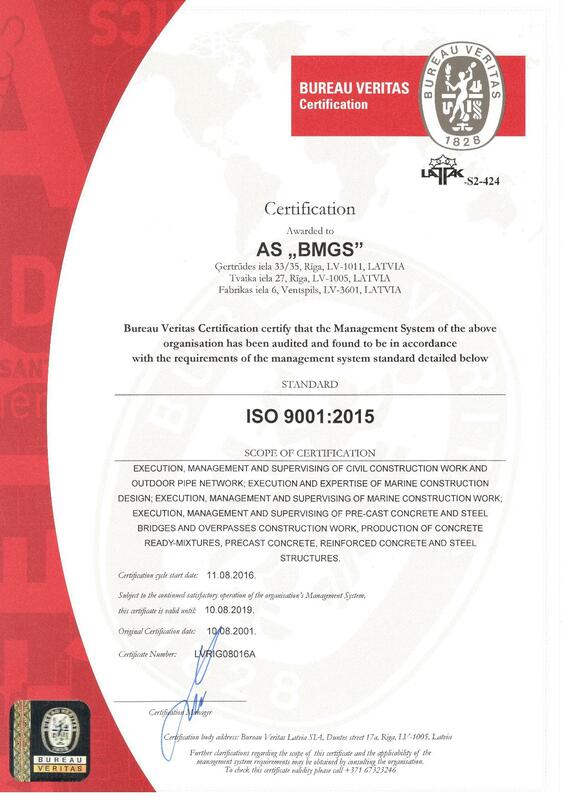 Besides, BMGS offers the potential customers its assistance in engineering and execution of geotechnical surveys. JSC BMGS is a legal successor of the Trust BaltMorGidroStroy founded in the Soviet Union in 1952. Since the very beginning of its activity the Baltic region became the most attractive market for BMGS, and up to now this region is connected with core businesses of the Company. In all the Baltic countries and regions BMGS established its representation offices, which promote strategic intentions of the Company. Being the construction contractor of the united Europe, BMGS aims to fulfill a multi-level reorganization of the Company, which allows to extend its services market. Geopolitical position of Latvia gives the small state possibility to serve as a bridge between the West and the East. BMGS has been making use of these opportunities for a long time creating partner unions, in which the Latvian company bridges gaps between Russia and the Western countries. On the one hand, BMGS has deep understanding of traditions and mentality of the eastern neighbour, on the other hand the Company is involved in a longstanding experience of business relations and joint cooperation with the European countries, and all these make BMGS an indispensable partner in realization of financial and construction projects with participation of the European and Russian partners. We have a firm intension of keeping up this kind of activity and develop our business relationship both in the East and the West.